Beginners welcome! 8 Years and up. Children and adults participate in one of 8 different levels depending on their age, swimmin g ability and previous lifesaving experience. Awards instructed were safety awards 1,2,3,4 and Rescue awards 1,2,3 and 4. Each award contained graded water safety skills which are taught and practised in the pool environment. The participants also learn Basic Life Support which includes CPR, rescue breathing and care for an unconscious or choking person. 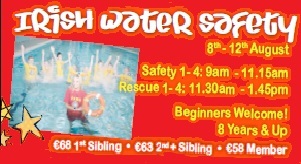 The participants are instructed by fully qualified Irish Water Safety instructors and also guided by two trainee instructors. Claremorris Leisure Centre are looking forward to holding another Irish Water Safety course in the near future so these participants can build on their lifesaving skills and new participants can also learn these invaluable skills.